After exiting the Stanley Cup Playoffs in the second round for the second consecutive season, New York Rangers General Manager Glen Sather decided to shake up his roster again. One season after dipping deep into the free agent pool for centers Scott Gomez and Chris Drury, Sather cut ties with captain Jaromir Jagr, veteran forward Brendan Shanahan, uber-pest Sean Avery and defenseman Fedor Tyutin. In their place, the Rangers added forwards Markus Naslund, Nikolai Zherdev and Dan Fritsche and defensemen Wade Redden and Dmitri Kalinin. But as long as Henrik Lundqvist is backstopping the efforts, the Rangers look to be in position to get at least as far as the conference semifinals. The hope is the new cast can get new – and positive – results. 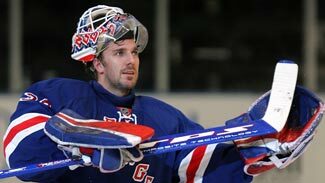 Lundqvist was a Vezina Trophy finalist for the third-straight season after leading the League with 10 shutouts. He finished in the top six in the NHL with 37 wins (fourth) and a 2.23 goals-against average (sixth). After playing 53 games as an NHL rookie in 2005-06, he's played 70 and 72 games. It's his durability and sustained excellence that have allowed the Rangers to return to the elite of the Eastern Conference after seven seasons out of the playoffs before his arrival. At 6-foot-6, Stephen Valiquette is the tallest goaltender in the League, but there's more to him than great size. Valiquette lost just once in regulation after New Year's, and he shut out the Flyers in Philadelphia in consecutive appearances there in late January and early February. There's no offensive dynamo or intimidating force on the Broadway blue line, but what the Rangers do have are six competent players who can move the puck, play solid defensively and chip in on offense. Michal Rozsival is the most offensively gifted of the bunch, but he's coming off hip surgery. He had a career-best 13 goals, but none over his last 26 regular-season games, and only one in 10 playoff games. He'll likely start the season paired with Redden, who was lured away from Ottawa with a six-year contract. Redden had just six goals and was a plus-11 last season, but after 11 seasons in Ottawa, it's likely the 31-year-old needed a change of scenery to reinvigorate him. Kalinin also could thrive in a new atmosphere. Knee and shoulder injuries limited him to just eight points in 46 games. He was a minus-7 last season, but prior to that he was a plus-18 player in eight seasons with Buffalo. The numbers might not show it, but Marc Staal had a solid rookie season. He had 10 points with a plus-2 rating, but showed poise under pressure while playing nearly 19 minutes per game. That number rose to more than 22 minutes per game in the playoffs. With a year of experience under his belt, Staal will only get better. The same could be said for Dan Girardi, who had 28 points while playing all 82 games in his first full NHL season. Paul Mara, who had 17 points and 52 penalty minutes in 61 games, is the closest the team has to a physical presence on defense. Bobby Sanguinetti, the team's 2006 first-round pick, will compete for a job in training camp. While offensively gifted, he'll likely start the season in the American Hockey League as he gets his first taste of defending in the pro game. New faces dot the roster up front as Sather hopes that by changing the ingredients, he'll find a recipe for consistent success that was lacking last season. Gomez and Jagr never clicked as a unit, so now coach Tom Renney will try Gomez with Naslund and Zherdev. Now 35, Naslund's point total has declined each of the last five seasons, but he still scored 25 goals last season in Vancouver. The Rangers play more of an up-tempo style than the Canucks, and with Gomez, one of the League's best distributors, getting him the puck, it's not a reach to think Naslund could score 30 goals for the first time since 2005-06. Zherdev had his best offensive output in Columbus with 26 goals and 61 points, but he never jibed with Blue Jackets coach Ken Hitchcock's demand that he play both ends of the rink. Zherdev may be lacking defensively, but skating with responsible players like Naslund, Gomez and Drury could allow him to flourish in New York. Neither Gomez nor Drury had the kind of season expected of them when they signed long-term, big-money deals with the Rangers last summer. Gomez tied a career-best with 70 points, but the Rangers only ranked No. 25 in League with 2.50 goals per game. After scoring a career-best 37 goals with the Buffalo last season, Drury slumped to just 25 goals, with a minus-3 rating. While Gomez and Drury didn't play up to expectations, youngsters Brandon Dubinsky, Nigel Dawes and Ryan Callahan were pleasant surprises. Dubinsky locked up the third-line center spot in training camp and finished with 14 goals and 40 points while playing all 82 games. He upped his level in the postseason, tying for the League lead among rookies with four goals and eight points. After riding the Hartford shuttle in the first half of the season, Dawes stayed in the NHL for good in January and responded with 14 goals, 29 points and a plus-11 rating in 61 games. He also had two goals in 10 playoff games. Callahan recovered from a sprained knee in November and extra seasoning in the minors to score eight goals and 13 points in 52 games, plus another four points in 10 playoff games. With the departure of so many veteran forwards, a number of youngsters will compete for jobs with the big club. Center Artem Anisimov had 16 goals, 43 points and a plus-16 rating as a rookie with Hartford of the AHL. Center Greg Moore, who was scoreless in six NHL games last season, had 26 goals, 66 points and a plus-27 rating with Hartford. Lauri Korpikoski showed some offense in his second season in North America, totaling 23 goals and 58 points with Hartford. * Whatever the Rangers lack on offense, the defense can make up for it. The team got better defensively after the All-Star break. Lundqvist went 15-6-5, and he allowed three or more goals just 11 times in his final 27 starts, with three shutouts. As a group, the team allowed just 70 goals in the final 31 games of the season (2.26 goals per game). * The team has been able to give young players major minutes and not suffer from it. Dubinsky and Dawes earned their minutes last season, and there are more talented players coming up through the pipeline. If Anisimov, Moore, Korpikoski and Sanguinetti don't earn jobs out of camp, expect them to see time with the Rangers at some point during the season. * Zherdev has a track record of scoring goals and confounding coaches, but Renney has shown he can handle any kind of player, no matter the size of his ego. If Renney can reach the same sort of comfort zone with Zherdev that he had with Jagr, Shanahan and Avery, the Rangers might have pulled off the best move of the offseason.